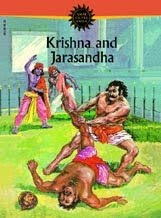 The Mahabharata talks about Jarasandha the king of Magadha who was born in two separate halves to twin mothers and was slain by Bhima in a wrestling combat. The two halves were put together by a witch called Jara and hence his name. Bhima, in a combat which lasted 27 days, would tear him into two and by magical power, both the halves would come together. Finally, Krishna picked up a piece of straw and broke it into two and threw the halves in opposite directions and the intelligent Bhima picks up the cue and tears Jarasandha into two and throws the halves in opposite directions. The two halves thus cannot come together and Jarasandha dies. My memory of the story comes, of course, from the Amar Chitra Katha. Jarasandha has returned.This time as a trope for splitting and division of self at multiple levels of being:emotional, personal, social, cultural, and spiritual. He is reborn in my Marathi poem,` Jarasandhachya Blogvarche Kahi Ansh' which is the title of my second collection of Marathi poems. My first collection of Marathi poems was titled, ` Bhintishivaichya Khidkitun Dokavtana' ( click here to download my first collection) which was published by Abhidhanantar Prakashan, Mumbai in 2004. So the second collection has appeared after almost five to six years and consists of most of my poems written in the period. The cacophonic collection is a parodic collage of ready made narrative materials in the public domain- from James Bond, Harry Potter and Peter Parker to Ravana, Jarasanda and the Bible. There is a distinct shift in the poetics from extremely subjective, surreal and self obsessed agonies of the first collection to parodic use of public personas, narratives and motifs. Though the chief characteristic of my poetry, the visual and surreal imagery, persists. 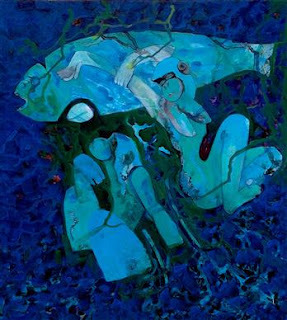 The cover of the collection is a fantastic painting titled The Colour of Genesis I by a well-known Marathi visual artist Deepak Shinde. My poems don't set out on a predetermined journey. They usually begin with a startling image or a motif which singes my being and I explore the possibilities inherent in this seed. I don't know what tree it will turn out to be. I have written a footnote on my poems in one of my blog entries.It discusses various contexts of my poetry and creative process. What I feel about Sita? When they humiliated my sister? If you are interested in the collection, please feel free to write to me at sachinketkar at gmail dot com.